One highlight: My Students. Let me tell you, my students have gotten me through the hard times of navigating full-time teaching. They are gracious, silly, eager, and willing. They bear with me during my lessons that flop. They laugh with me when I’m going crazy from my workload. They are always eager and willing to try new activities. My class is truly one-of-a-kind; I wouldn’t be the teacher I am today without them! One lowlight: Exhaustion. I’m going to be honest and tell you that when 8:00pm comes around every night… I find myself longing for my bed. From getting up early to exerting all of my energy at school, I often find myself being very exhausted. I’m not someone who runs on caffeine either – ya girl over here uses her raw energy every day! While I’m exhausted, I do not find that I’m overworking myself. I try to keep a healthy home/school/classwork balance. However, teaching is no small feat! It’s all about learning how to keep a healthy balance for you and learning how to fuel yourself when you become exhausted. One piece of advice: You are more capable than you realize. While I’ve been full-time teaching I have had the opportunity to assist my cooperating teacher in other tasks around the school. For example, I am putting together the second-grade act for the Christmas performance at our school! The advice “you are more capable than you realize” comes into play when staff members at your school ask for you to help them on certain projects. Don’t overwhelm yourself – load yourself with a healthy amount of extra work, but go out of your comfort zone and don’t be afraid to say “yes” to something you’re a bit nervous to do! Okay, now that I’ve shared a few of my reflections on full-time teaching I’m going to shift the focus to the fun event I went to on Saturday night! With the Chicago Semester Program, I was able to go to the Bulls and Cavaliers game this past Saturday night! 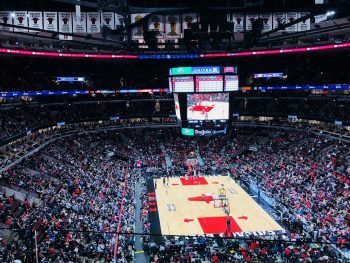 I’m not someone who knows much about basketball, but who would I be to pass up an amazing opportunity to see the Bulls play at their home stadium? It was definitely an unforgettable night! Like I mentioned above, the semester is rapidly coming to a close. I’m trying to soak in all of the moments I can before this time is over. By paying attention to the small joys, reflecting deeply, and wholeheartedly investing in my students, I’m confident that these last few weeks will be tough but oh-so-rewarding!